This paper explores the need for a competitive game for sighted and blind players alike, its effectiveness in fighting prejudices and how it can contribute and facilitate the inclusion of people with visual disability, when played by heterogeneous groups of players. The first part presents the state of the art about competitive games for blind and low vision users. Focusing on the typologies of games already on the market, and on the apparent lack of fast-paced multiplayer games, it shows a current space for research and development. Then, we present WaTa Fight!, a competitive casual party game that can be used by sighted and blind players alike, outlining its development, from its concept to its design and testing – conducted via focus groups and survey. Finally, we discuss the results obtained in terms of the game’s effectiveness in addressing the visual impairment topic and in fostering integration. Keywords: Visual impairment, Inclusion, Competition, Party game, Mobile game. In between the 19th and 20th century, the queen Carmen-Sylva of Romania aimed to create a town for blind people only. The queen thought this proposal would improve the life of those who are blind, as she identified this condition with the inability of living a complete life in the society (Alliegro, 1991, p. 13). Such a line of thought was by no means an exception. For example, in 1865 the newly born Kingdom of Italy, with the article 340 of the Civil Code, placed blind and deaf citizens under the legal guardianship of tutors, aggravating their condition of deprivation. Today, most of the States’ legislation in the matter of disability recognizes the importance of the integration of individuals with special needs in the society (Mangiatordi, 2017, pp. 19-20; p. 45; Istat, 2013), but a significant part of the media still uses old tropes to depict disability, often including damaging stereotypes as many pop media portray blind and low vision people as incapable of behaving normally (Barnes, 1992). The cartoon series Mr. Magoo is a well-known, evident example of such tendency: in each episode the old man reveals himself incapable of understanding any dangerous situation he faces, prevailing out of pure luck. This stereotype, done for comedic effects, is so damaging for the blind and low vision communities that they protested upon the theatrical release of the live action Mr. Magoo movie in 1997 (Maurer, 1997). The problem with the media depiction of disability is often related to its exclusiveness: the person with disability is represented as different from the supposed normality and hence detached from the society (Barnes, 1992, p.19). In order to expose the socio-cultural bias and truly integrate individuals with disability into our society, it is necessary to fight prejudices by creating heterogeneous communities and reducing those social barriers to their everyday activities (d’Allonzo, 2008, pp. 52-61). Among the various media, games also dealt with individuals with special needs and their issues in such areas as single- to multi-player, from audio games to board games and video games. The interest of the community in this subject has expanded over the years, as more researchers investigate different forms of gaming and playing. On the one side the academy shows specific interest towards education and learning (Gandolfi et al., 2016); on the other, the community of practice (especially indie companies) designs games that place non-impaired people into someone else’ shoes (Blind Arena Tournament, 2017; Perception, 2017; Footsteps, 2016; Blindfield, 2016). As the games for the social change field of practice and literature demonstrate, games can be a way to inform and persuade the general public in a cause (Bogost, 2007; Kaufman & Flanagan, 2015; Bertolo & Mariani, 2014; Mariani, 2016). So far, except for a few examples, games for social change tend to rarely be competitive, but rather individual. This limits interaction and exchange with other players. Challenging such trend, the attention has been drawn on competitive online games as sources of thrilling interaction and deep engagement. Indeed, community creation and bonding are key components of successful competitive online games as in those actions are often sensationalized to widen the community with an audience of spectators (Hamari & Sjöblom, 2017; Gandolfi, 2016; Cheung & Huang, 2011). Therefore, competitive gaming may be a way to fight the prejudices about the inability of blind and low vision people, helping the process of integration. In this scenario, mobile gaming accounts as one of the most promising frontiers and flourishing branches of the game market (of which it represents about 50%), confirming a double-digit growth since the launch of the first smartphone in 2007 (Newzoo, 2018). The worldwide distribution of mobile devices, their extensive and growing accessibility (affordable prices, user-friendly interface, and a good usability in general), alongside with the improvement of the communication infrastructures, and the abundance of titles in the app stores platforms nurtured a healthy and promising environment. Surfing between game studies and design research, this article investigates how a game can address the issue of blindness or impaired vision through a game aimed at fostering social inclusion and comprehension. From the analysis of games for blind and low-vision players on digital devices, the article describes the design process of a competitive audio game prototype, including the tests for evaluating its usability, playability, and effectiveness in helping the integration of people who are blind or have low-vision. WaTa Fight! is the outcome of a MSc thesis conducted at Politecnico di Milano, School and Department of Design, and it belongs to a broader research addressing the topic of social change in general, and social inclusion and communitarian comprehension more specifically, held in ImagisLab research group by Maresa Bertolo, Ilaria Mariani, and students. As other thesis researches developed in ImagisLab, the work presented here has been structured as (1) a phase of literature review and case studies analysis; (2) a design phase of the prototype conducted as an iterative process; and (3) testing with end-users, enquiring the game both as an interactive product and a communicative system able to deploy meaning through its gameplay. The decision to develop a competitive game depends on the market analysis. As related pieces of information could not be found in literature, the research methodically examines the titles collected in the Audiogames.net database aiming at a better understanding of the genres of audio games in use. Among the several online databases and repositories of games suitable for blind players, Audiogames.net stands for being cross-platform, presenting titles for PC and mobile devices alike, and unlike most of the other similar services, for being independent of any development company. Moreover, Audiogames.net offers an indexation of the titles that facilitates the market analysis process. In the initial research phase, each game category in the archive has been listed, ruminating on the size of the group and the attributes of the content. To further represent the site content and nurture the analysis process, the games have been grouped into specific clusters that classify the experience offered by the audio games listed (fig. 1). A line of reasoning that is transversal to the clusters identified, the games on Audiogames.net resulted to be mostly narrative and slow paced, often shaped as online multiplayer text-based games, in the fashion of Multi-User Dungeons. Further diving into the analysis, it emerged that the repository does not include any case of competitive, multiplayer, fast-paced, audio-based game; such vacuum emerged as a potential space for design. Therefore, it has been conceived as a game concept that adheres to the identified needs and fills a design space with interesting untapped possibilities. To maximize mutual exchange and encourage socialization, it has been designed as a party game: quick to play, with easy-to-grasp rules, based on soft skills such as agility and concentration, and with a special focus on the interaction between players. In addition, it has been conceived “for players”, regardless of their ability to see. Figure 1. 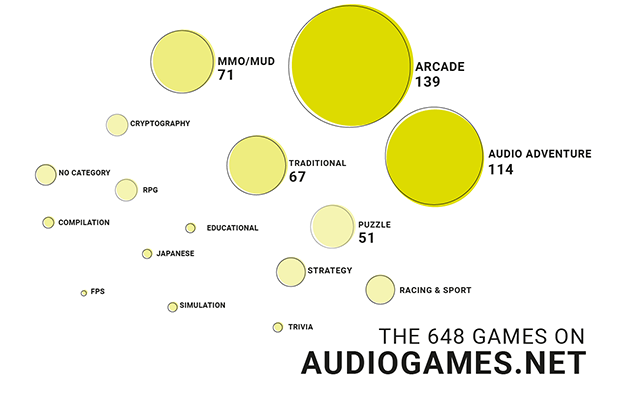 The 648 games on audiogames.net categorized into clusters. Targeting individuals who are both sighted and visually impaired dictates special requirements. On the ground of the competitive audio-based game WaTa Fight! there is the study of video games and games directed to the general public as well as of interfaces for users who are visually impaired. Considering the aforementioned reasons for conceiving a casual party gaming with competitive elements, the main sources of inspirations were the series of Nintendo party games 123 Switch (2017). These mini-games characterized by short matches focus on the speed and precision of the participant’s movements, with almost no use of graphics. Considering the market, the target(s) and the intent of soliciting integration and dialogue, the game and its gameplay do not pivot around visual elements. In the game, players must perform actions faster or more precisely than their opponents to gain points. Moreover, the narrative itself relies on a strong metaphor that subtly enhances the game meaning, without stressing its topic (Kaufman & Flanagan, 2015; Mariani, 2016). WaTa Fight! is a competitive casual game where players are Ninjas that battle for glory in a Great Martial Art Tournament. As Ninjas hiding ability is legendary, no one can see them. In a match, two players face each other by tapping on a smartphone screen faster than the opponent in order to perform an attack. To fight, each player uses a smartphone in landscape position, held between the hands, with the screen facing the opponent, equalizing a player with and without visual disability. 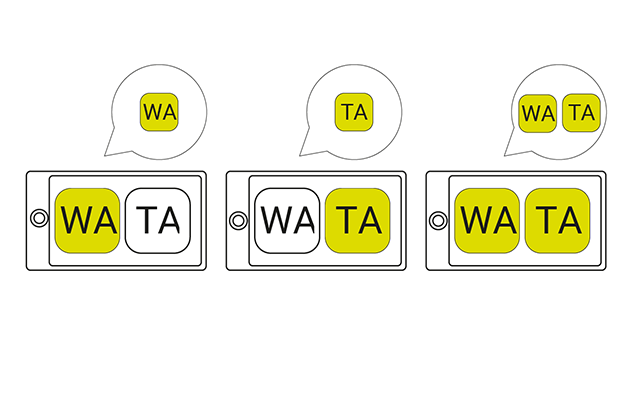 On the smartphone screen, there are only two large buttons, named Wa and Ta respectively (fig. 2). The two Ninjas fight by pressing them to attack the opponent with a Wa or a Ta move, or even both to perform a WaTa attack: a powerful move combining the two base ones. According to the command pressed, the smartphone shouts the ongoing attack, giving the opponent the possibility to parry by quickly tapping the same attack on her/his smartphone. Figure 3. Wa and Ta buttons on the screen. According to the fictional world of reference, Ninjas are epic fighters, and as such, they can be wounded only in the Honor. Players start with 3 Honor Points. Each successful attack performed steals 2 Honor Points to the opponent; however, the opponent may parry, blocking the attack effect and stealing back 1 Honor Point. The match ends after a set time, and the winner is the contestant with the highest Honor score. As only two players participate in each match, other people are encouraged to spectate the action, even disturbing the players’ actions with their voices. To this end, it is also possible, but optional, to connect the game to a computer screen or a smart TV to visualize a leaderboard displaying the current game statuses. Focusing on the visual and interactive aspects, the game touch-based interface required several sessions of reflections and field experimentation. It was loosely inspired by BrailleTouch 1 (Frey, Southern & Romero, 2011), a mobile texting application for blind and low-vision users. Developed by a team from Georgia Tech, this Braille-like texting app uses a six-button wireframe on a landscape positioned smartphone to simulate the structure of the Braille writing system and support visually impaired people to easily type on a screen, without even looking at it. The game prototype was originally conceived with an eight-button interface, with 4 buttons on each side of the screen. However, still in the early concept phase, the studies in literature (Frey, Southern & Romero, 2011) led to the reduction of the number of buttons – initially from 8 to 6, as in the case study mentioned above. However, timely early tests with end-users called for a further simplification of the structure. Blind and low-vision persons proficient in Braille, as well as sighted persons participated to a set of very early tests consisting of tapping on the screen to complete some series, interacting with a different amount of buttons. Testers were asked to interact with two interfaces: the first had 4 buttons, the second had 6. The results were key in terms of design, defining how many buttons players were able to “comfortably manage” in the meanwhile, as well as their degree of feeling at their ease in using the button-based interface. All the players tested the four-button version without experiencing awkwardness or discomfort. On the other hand, all players but one stated that they felt “uncomfortable” in managing six buttons, being reluctant even to try such wireframe version of the interface, envisioning the interaction as distressful and unpleasant. The six-button interface was perceived as complex and also “scary” by some of the playtesters that asserted that the mere request made them feel distressed. Based on this feedback and subsequent analysis, the first and current playable prototype of the game uses only two buttons, one for each side of the device (fig. 2). The decision was due to the typology of game (party game) and to the time necessary to get adjusted to four potential combinations and their feedback. The analysis took into consideration that individuals with low-vision or who are blind cannot take a look at an explanation screen, but rather have to hear the voice tutorial. In essence, explaining how to use 4 buttons plus their combinations requires a certain amount of time, and significant attention for memorizing the sequences and their meaning. Because WaTa Fight! is a party game directed toward a casual audience, a fast learning curve is optimal and an audio-based learning process is more methodical and slow (Rashtian in Nasar & Evans-Cowley, 2007, p. 45). and later involved in focus groups with semi-structured questions to further unpack specific topics of relevance. The playtests, held in three sessions, involved a total amount of 14 players (m: 6; f: 8), of which 9 individuals were sighted, and 6 players were legally blind. In this phase the involvement of blind and low-vision end-users was pivotal to verify the usability and playability of the game in primis (as explained above), but also its ability to trigger social integration among the players, independently of their visual ability. To ensure an optimal experience and the inclusion of the final audience, the focus groups were organized with and supported by the Unione Italiana Ciechi e Ipovedenti (the Italian Blind and Low Vision Association) of Novara. The field tests occurred from May to June 2018, as shown in fig. 3. Each playtest and the focus groups have been recorded and shot to capture the full event, aiming at a follow-up in-depth analysis; in parallel, the researcher in charge of the observation conducted rapid ethnographies. Figure 4. 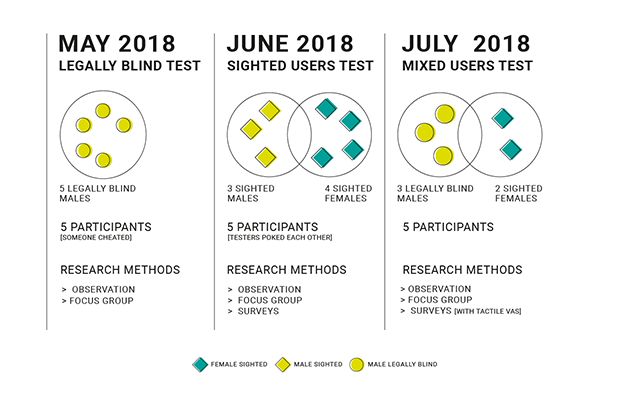 A visualization of the three playtests made stating the number of participants, their gender, sight condition and the tools used at the encounter. The first version of the game has been playtested on May 2018 and involved 5 attendants, all males and legally blind, from 20 to 45 years old. Because of the nature and timing of this investigation that occurred in the very early stage of the design phase, this playtest mainly consisted into a field experimentation about players’ ability to press different number of buttons and interact with them through time. As a result, this first playtest, as described above, resulted to be more a usability study than a real analysis on the game effectiveness in prompting social integration. 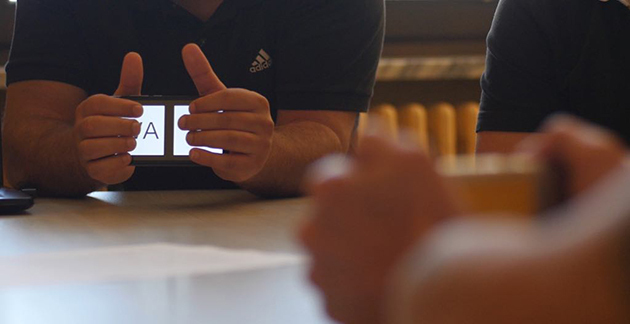 As suggested in the literature (Mariani, 2016, p. 79) each playtest was followed by a questionnaire and then a focus group (with semi-structured questions), whose tone was kept conversational and relaxed in order to stimulate the participants to express themselves freely, encouraging the discussion potentially beneficial for the research. particular aspects of the experience. Apart from the profiling set, each question is meant to assess the effectiveness of the game in pursuing design goals, both in terms of UX and UI. the experience as a spectator during other players’ matches. The game duration is linked to the functioning of the game flow and the difficulty curve, or the experience fun factor, as the time perception of a player changes in accordance to its immersion in the game activities (Rockholz, 2014). The possibility to play the game with friends allows to better comprehend the quality of the experience and possible feelings of empowerment. Finally, the last point analyzes the experience from the perspective of the game spectator, namely of the one who observes the player, rather than the player itself, and the game communication possibilities of such users. This paragraph outlines the results coming from the questionnaires and the focus groups conducted during three sessions of playtesting 3. The first playtest was made with six legally blind participants. Among them, only one had some video-game experience, while most of the participants had at least occasionally played board games with the help of sighted friends – most notably Taboo, Clue, and Monopoly. Significantly, none of the participants declared any interest in playing with the smartphone in their everyday life, but they all stated to have good computer skills and to be interested in technology. That said, the first field experimentation was conducted with a wireframe interface, mainly serving as a usability test, aiming at understanding the players’ attitude towards the game, as well as their mood and feelings. Despite the still prototypal phase, the data defined the number of buttons players felt comfortable handling at the same time, and suggested a good level of emotive participation. The game length was perceived differently by those who won and those who lost; appropriate amount of time was perceived by winning players, and too short was perceived by the losing ones. However, speaking of pleasurability, the game was unanimously perceived as enjoyable and pleasant: rules were considered as easy to understand and remember, and the gameplay provided entertainment and recreation. These results confirmed what observed via ethnography, regarding the general mood and feeling. Game Master: Would you like someone else to try the game? The answer provided by F was a sort of thinking aloud process that underlined the desire to share the experience with someone else. However, what seems key is the fact of being allowed to play with a sighted person, without disadvantages of any sort. On the opposite, as stressed by G, who kind of completed F’s thought, this game almost becomes a way to “beat them up”. As if the fact of being visually impaired, for once, is giving an advantage, rather than being a handicap or a limitation. In these terms, WaTa Fight! turned out to facilitate interaction and social gatherings, overcoming the frequent issue due to visual disability. That is because to be good at this game is not important to be able to see, but to have reflexes, memory, and readiness. Then, the participants of the focus groups claimed they also enjoyed the experience as game spectators. a data that seems in line with what was observed. However, spectators’ attitude and behaviour varied depending of the composition of the group. 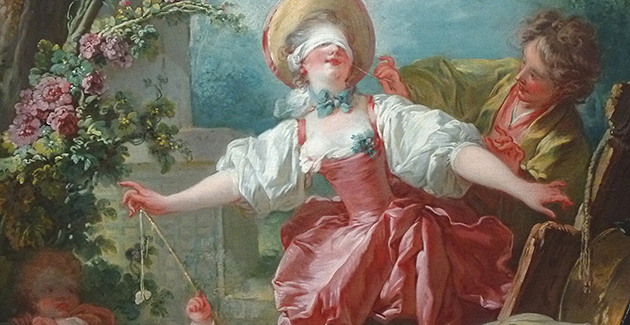 The spectatorship of a match with a mixed audience turned out more aggressive and “present” than that involving only non sight-impaired players. The playtest with just legally blind players saw the participants stand in silence, listening to the game audio in order to better understand the match status, whispering each other the score after each move: blind spectators cannot see the score, and therefore their observation is more centered around memory efforts. Playtests with mixed audiences were more effective in facilitating interaction and, above all, integration – that is further nurtured by the fact of going through a shared, meaningful, hands-on experience. It is also worth adding that the level of participation and interaction has varied according to the character, disposition and charisma of the players involved, and in consequence to the atmosphere that has been created. This serves to underline how the nature of the personalities involved has strongly influenced the perception of the game, in terms of experience. The second and third playtest encounters were held in June and July 2018. One involved sighted participants only (n: 3 m and 4 f; age range: 22-32), the other mixed legally blind (n: 3 m; age range: 25-32) and sighted ones (n: 2 f; age range: 26-28). All but one considered themselves expert gamers, and 3 out of 5 affirmed to have at least some information about visual impairment. The two sighted playtesters evaluated the experience as positive and pleasurable. The only exception was a participant who won all the matches, and defined the game “too easy” – it has to be said that the player was highly coordinated and fast. The game narrative and the tone of voice, in general, were unanimously considered fitting to the project goals. Choosing the fictional world of Ninjas contributed in terms of meaning making: the game activities gained indeed meaning because of the narrative context within they were set. As a matter of fact, screaming attacks as Wa and Ta and WaTa was not perceived as awkward or embarrassing. In parallel, also the game aesthetic has been appreciated and commented as a further trigger for enjoying the game, stimulating more playful interactions. In parallel, remarkable information emerged as regarding the topic of sociability, showing encouraging results from both sighted and blind playtesters: all the participants stated that the game nurtured sociality, helping them to release some inhibitions in bonding with each other. However, the direct observation of the matches of the last playtest with 7, mixed participants (n: 3 m; 4 f) revealed that the sighted attendants were more active than the visually impaired counterpart, and prone to actively distract the opponents. Most of the participants attempted to disturb the game tickling and poking the other players to make them fail. When asked, the playtesters explained such behavior as resulting from a general discomfort using sound-based disturb attempt: the touch sense was therefore considered the more effective in the task. Covering the game ability to convey meanings and nurture mutual comprehension, and hence its effectiveness as a communication system able to facilitate the integration of visually impaired people, WaTa Fight! seems promising. 16 playtesters on 18 stated they felt a general sense of openness towards the topic of integration after the game experience. Nonetheless, the game is still in a prototype stage, with only the core gameplay implemented. A more complete product is needed in order to to proceed with the experimentation and in order to determine a complete idea of the full possibilities offered by the game. However, it is still possible to take stock from what we observed up to date. Even in a prototypal state and with a small test sample, the results are encouraging. First of all, the information collected during the observation, as the general understanding of technology, the dynamics generated, and the basic gaming experience of the participants reinforced the initial idea of choosing a situated party game for mobile devices. Data from the focus groups and the survey indicates that the participants have shown signs of openness and sympathy toward the theme and the other group members. The most effective and satisfying results were collected when the game was played by both blind and sighted players. In particular, the reaction of blind players is meaningful. They showed a clear interest in playing the game again, especially with sighted opponents, underlining the game high potentialities for facilitating inclusion and integration of people with vision impairment in groups of sighted individuals. Matter of factly, the game resulted an effective means for stimulating experiences that turned into constructive discussion and comprehension. It prompted players and spectators to talk about disabilities because of the constraints it imposed on the in-game actions through their mechanics and aesthetics. Games can use procedurality (Bogost, 2007; Sicart, 2011; Mariani, 2016), mechanics and also a fictional world to simulate disabilities, giving players an understanding of the difficulties encountered by a segment of the population. The results are consistent with what corroborated by both literature (Gandolfi et al., 2016) and field research that suggest that games can be of help explaining disability. They are especially aligned with the social approach promoted by the WHO that sees the disability as a quality of the interaction between people with special needs and an environment that restrains them in pursuing personal goals (WHO, 2011). This game shifts attention from the commonly primary sense, sight, becoming easy or difficult independently of the ability to see, but relying only on coordination. Consequently, and for obvious reasons, it is not suitable for certain types of motor disabilities, on which however we have not carried out any test. Then, because of the target, a key element is that the game should be available on an easy-to-use platform, using a user-friendly interface able to smooth as much as possible the interactions and lessen the visual imbalances among players. We would like to express deep gratitude to Giuseppe Laganà and the Unione Ciechi e Ipovedenti of Novara, for their support and patience in helping with the game testing. Our grateful thanks are also extended to Francesco Venco for his guidance in making the game infrastructure and for his useful critiques during research work. We are very grateful to Gianluca Poma for the support. We thank Vittorio Silini for giving his voice to the game prototype, the sound designer Marius Arcioni for the music of the project, and the video maker Giulia Emma Nocerino for her help in documenting the playtests. Alliegro, M. (2016). L’educazione dei ciechi. Storia, concetti, metodi. Ronciglione: Armando. Barnes, C. (1992). Disabling imagery and the media: An exploration of the principles for media representations of disabled people. London: BCODP. Bertolo, M., & Mariani, I. (2014). Game design. Gioco e giocare tra teoria e progetto. Milan: Pearson. Bogost, I. (2007). Persuasive Games: The Expressive Power of Videogames, Cambridge/London: MIT Press. Cheung, G., & Huang, J. (2011, May). Starcraft from the stands: Understanding the game spectator. In Proceedings of the SIGCHI Conference on Human Factors in Computing Systems (pp. 763-772). ACM. D’Alonzo, L. (2008). L’Integrazione del disabile. Radici e prospettive educative. Brescia: La Scuola. Frey, B., Southern, C., & Romero, M. (2011). Brailletouch: mobile texting for the visually impaired. International Conference on Universal Access in Human-Computer Interaction (pp. 19-25). Berlin, Heidelberg: Springer. Gandolfi, E., Ferdig, R. E., Bedesem, P., & Lu, C. C. (Eds) (2016). Mobile learning and Special Education. ID&A Interaction Design & Architecture(S), 28. Gandolfi, E. (2016). To watch or to play, it is in the game: The game culture on Twitch.tv among performers, plays and audiences. Journal of Gaming & Virtual Worlds, 8(1), 63-82. Hamari, J., & Sjöblom, M. (2017). What is eSports and why do people watch it? Internet research, 27(2), 211-232. Millen, D. R. (2000). Rapid ethnography: time deepening strategies for HCI field research. In DIS ’00 Proceedings of the 3rd conference on Designing interactive systems: processes, practices, methods, and techniques, (pp. 280-286). ACM. Parlamento del Regno D’Italia (1865). Codice Civile Libro I/ Delle persone, Titolo X: Della maggiore età, della interdizione e della inabilitazione (Artt. 323-342).